Cédric Volon spent some years in Mexico and discovered the Lotería cards, a game of chance like Bingo. All the 54 cards are numbered, named and illustrated. This is now a traditional and popular Mexican game and the current images have become iconic in Mexican culture. It was also the starting point for a new playing cards publisher. 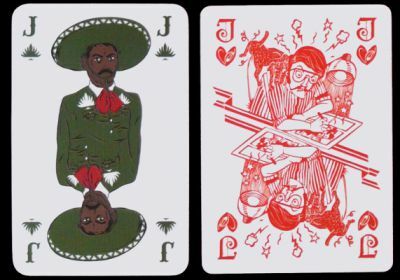 Cédric took its company name from the 42nd card (la Calavera or the Skull) and published with the art gallery La Sonrisa de la Muerte its first pack of cards “Santo Mexico”. Personally, I prefer the second pack “Gallia Belgica” which had been published in Brussels. With the joker, thirteen Belgium iconic figures have been represented.